We are very pleased to announce that the First Annual MV Mini Maker Faire will take place on Saturday, May 7, 2016 from 10am to 4pm at the Ag Hall in West Tisbury. Come enjoy a great day of perfect Vineyard weather, arts and crafts, science and engineering, food and music, fire and water! Don’t miss a thing – check back here for updates on the event. Are you a Maker or know someone who wants to participate (for a free, super awesome t-shirt?) Answer our Call for Makers by filling out our online Participation Form. Interested in regular updates? Follow MV Mini Maker Faire on Facebook. Not sure what the Mini Maker Faire is all about? Read our About page and start getting excited! We're currently looking for Makers, Presenters & Performers! Take part in the action by filling out our online Participation Form. 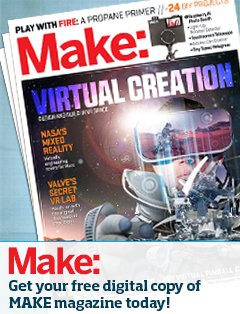 Martha's Vineyard Mini Maker Faire is independently organized and operated under license from Maker Media, Inc.